My first artist residency abroad was for two weeks at Cat'Art Centre in south western France, at the edge of the Pyrenees Mountains. Ste. Colombo sur l'Hers is an idyllic agrarian village. An abandoned comb factory (which used cow horn for it's products) provided apartments and studio space for visiting artists from all parts of the globe. My roommate and I were American, but one artist was from Spain, one from Africa, one from China and another from Britain. I proposed to continue to paint directly from the landscape at night. For over twenty years I had been fascinated by how much color there is after dusk. Since graduate school, I worked in pastels on location and made mono prints using oil paints on litho aluminum. At Cat'Art I was given a studio with a press so when not out painting or drawing with pastels, I was making prints. The flight over to Amsterdam was clear enough to experience how light the night sky can be naturally. As I followed the progress of the plane on the screen mounted on the seat in front of me, I could see that over Labrador and the Arctic, the sky had a very warm light along the horizon despite the late hour. Thin lines of pink illuminated rivers as liquid silver flowing through the soft blue gray sea of clouds. Amsterdam was cool and rainy. There were lots of indications that Spring has taken hold here, but the light of the day was flat. Toulouse is rainy and gray too as I arrive. The yellow stucco and terracotta roof tiles warm up the otherwise gray cityscape. There are flowering trees and shrubs in bloom, irises and roses in gardens and containers filled with color. It is cool but clearly Spring, two weeks ahead of New England. A canal runs through the city; the water strewn with petals from the bloom. I take a bus to Lavelanet, south of Toulouse where Christian, an artist from Cat ‘ Art will meet me. I am surprised and pleased with how beautiful the Cat'Art Centre is. My room has a wonderful view of the church spire in the town center, seen through the gardens of houses as they ascend the hillside. It is cloudy still, but the light at night is soft and subtle. I hope to work from this view. First to sleep; I have traveled for 18 hours and need to get on the right time. I have set up my studio which has the same view and is across the courtyard from the apartment. This mill setting, once a comb factory, has so many places to explore! The artists that are working at Cat’Art met for coffee this morning at La Forge, the other site which is a ten minute walk from L’Ile (where I am staying). Both sites are in the small rural town of Sainte Colombe sur l’Hers. It is what I would call a mill town, with water that runs in narrow streams everywhere you look. La Forge has a beautiful veranda overlooking the pastures that surround it; rolling fields that descend from the Pyrenees Range. Most of the artists here right now are women. Stephanie is experimenting with drawing, she’s from the Bay Area(we share the apartment); Ngogy is a painter from Nigeria; Diana is from Australia and works in new media; Bridget, a painter from France; Mercedes is another painter, from Spain and Lien is from Taiwan and works in animation. It was helpful to meet the other artists on the veranda and get a better idea about the center. In the afternoon I took a trip into Lavelanet to get food and find a source for paint. I also found a nice bike path that I will try tomorrow. I did have time this morning to look around town and paint a small piece about the flight. Flying always gives me ideas for painting, but I rarely follow up a flight completing something. This morning I had a chance to ride the bike that we all share here at L’Ile, to look around and see outside the walls of our studio center. At 8:00 it is quiet; older people working in their gardens, people walking dogs, men on road bikes passing through town. The only children that I have seen have been two girls walking to school with their mother on Friday morning and one from the village store delivering bread to Mercedes, the painter from Spain. My studio is across the court yard and is so large that I wish that I could increase the size that I am painting. I worked on a pastel of the view at night from my bedroom window, a painting from the flight and in the evening went up above the village with Stephanie to paint looking west over to Lac Montbel. We hope that it will warm up enought to swim at the lake before we go home. Today has been fairly productive despite the clouds. It helps that I work at night too. I took some time this morning to photograph the pastel I have been doing from my window and found that I could take a self portrait in the plate glass, superimposed over the texture of the traditional French lace curtain; Voila, me in St. Colombe. After lunch Stephanie and I walked to La Forge and worked in a cornfield there. I hope to be able to finish this painting tomorrow and begin another there in the fields to the north of the village. When we returned, five of us who live and work at L’Ile made dinner and had a chance to get to know each other better sharing a nice meal. With some extended hours of sun I have been happy to paint at two sites today. The corn field above La Forge was really bright and I had a chance to finish the piece that I started yesterday. This morning I worked just outside of L’Ile by the river facing a long colonnade of trees. Everything I start takes two sessions so I hope the weather will be clear for the next couple of days. Christian came and showed me how to use the press and let me have access to some equipment that he has stored in my studio for its use. Tonight Stephanie and I played around with it and embossed some leaves, old lace and printed some ink to see what we could get going. The water crayons that I brought to use do not have enough pigment in them to work in the way that I have used Karan Dache crayons in the past, so I will have to do some improvising. Photography does not do the countryside justice in France, especially on a clear Spring day. Four of us took a trip to Carcassonne to buy art supplies and see the sights. The winding drive along the vineyards was brilliant; red poppy fields ignited the yellow greens of cultivated rows. White cows grazed in the tall grass, followed by a red faced farmer with a long switch. We had lunch in a Bistro in the plaza of this walled city to the North of Ste. Colombe. It was lovely to just enjoy the people watching and the sun. On the trip back we took a slight detour and stopped in Mirepoix which is a 12th century medieval town of Tudor architecture with exposed wooden beams. The variety of color of these early row houses was great to experience. I enjoy seeing the french combinations of pigmented stucco and painted wooden features, ie. shutters, doors and windows. Here in the South, blue is used in a variety of shades. The beautiful craftsmanship of the heavy doors has stood the test of time. It takes awhile to get accustomed to the schedule of life here in Ste. Colombe. Like elsewhere in Europe, the mid day is for eating and socializing. So if you don’t plan ahead, you can arrive somewhere and everything will be closed for midi. Stephanie and I decided to get lunch in town at the one restaurant “Chez Esme” and see the village from a different point of view. At noon after working in our studios for the morning we walked to the main square and had le menu in a rustic room,with a fire going and mounted, stuffed heads of game from the area. The meal was good, a salade of grated carrots, sausage and ham and a main course of steak and pasta. It took about two hours to complete, but it was nice to be in the center of the action. I painted out of doors after lunch and was able to make a little progress on the painting that I am doing here in town. The sun is getting to be strong and it stays light until10:00 at night. Tonight Stephanie went with me to draw by the river after it got dark enough at about 10:30. We worked from a spot against the bridge that we walk over to get to La Forge. This morning I took the bike and rode out of the village to the west of Ste. Colombe to Le Peyrat. The view from the bike gave me a chance to see the farming activities of this region and to take pictures of gardens, architecture and the Peyrat village square. Because doors and windows are left open and so much of life goes on in plazas, as you ride you can hear the French of the children in the school yard and smell the local cooking. The butcher shop had a very distinctive smell too, almost overwhelming. I continued on to La Bastide Sur L’hers where I was able to get a baguette, coffee and a few things that I was running out of. At the local market I saw two people tie up their horses to a tree to go into the shop. They had been traveling by horse through the countryside with saddlebags and bedrolls. I think that would be the perfect way to see the natural surroundings here at the edge of the Pyrenees . Last night Bridget introduced us to Muscat, a sweet wine only grown in the south of France by the sea. We drank it either with a little Perrier or by itself and it had a wonderful taste that was light and refreshing. We could see why Bridget was so happy to find a brand of Muscat available at the local market. Her plan is to have a ready supply for the summer months. With an opportunity to go to Levalenet for food today we decided to also look for bottles of Muscat to bring home. On the way back to L’Ile after accomplishing our mission, we stopped at a shop where combs were made by hand from cow horn. This is what was also made at the Cat’Art mill buildings in its’ early history. I was so glad to see the process and find a locally made craft that was so useful. We found out later that the shop is rarely open and we felt very lucky to have stumbled upon this piece of L’aude’s past . I decided that I would give the press a try today. The first monoprint had a bubbled texture from the solvent that Christian said that I could use. With the language difficulty I think that this solvent would be better to clean up and not to use as a thinner. After searching through all of the utility closets, Bridget gave me some of her turpentine so that I can continue to print. Stephanie and Jean-Luc are leaving this afternoon so that she can be in Toulouse to catch an early flight in the morning. I am so sad to loose a great room mate and interpreter. It has been wonderful to have a like minded artist to share this residency experience with. I’ll miss our night walks and drawing by the river and painting out at La Forge. Her vision has contributed to my view of Ste. Colombe. The weather turned out to be sunny and cool which allowed me to work on the painting that I am doing just to the east of the the village. I still need one more sunny afternoon to finish it because I keep going in circles with the color. I woke with a thrumming this morning out of a deep sleep. It was too rhythmic to be the banging of a shutter, which persisted throughout the night because of the high winds. The drum beat was picked up by the rest of the band, which was marching through the streets of the village. It turned out to be another French holiday, the second since I arrived. I ran outside and tried to find their route and was able to take a few photographs from in front of the group consisting of all ages. No one from the center seems to know what the holiday is but it is another excuse to close the shops, bank and post office. In the studio this morning I was able to do a monoprint before setting out with Bridget to visit Grotto de Niaux. This is a cave where you can see actual paintings from the prehistoric period which is becoming limited in France because of the fragile nature of the paintings. It was a great experience to go into the grotto and see the delicate line drawings that use the relief of the rock. There was snow in the mountains this morning and in Niaux we were up at enough elevation to see the white covered peaks. It was warmer in the cave and worth taking time out from painting. It was the coldest morning yet today. I found it hard to get started, but a hot cup of coffee got me to the studio and I began organizing to finish the monoprint I have been working on through the rain. Bridget and I made a trip to Laroque to get fabric from the factory outlet that we discovered the other day. There was the traditional French even weave linen, several really beautiful awning striped cotton canvas’ and silks too. I was happy to find a tablecloth, some dish towels and a piece of canvas to make a camp stool seat. It was fun to spend time looking at such wonderful color. On the way back to Ste. 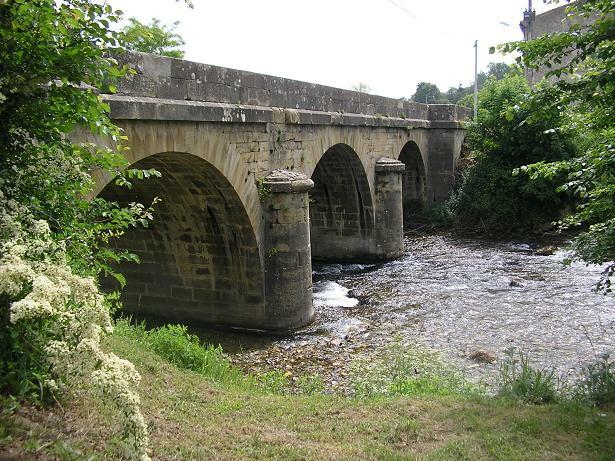 Colombe Bridget showed me a group of country houses that faced an old stone bridge and a rapid river. After last nights rain and with the afternoon brilliant sunshiine, it was a magical place. It was easy to imagine escaping the hectic life of Paris and coming to the country here in Le Peyrat.